Kerala, in south India, is often referred to as "God's Own Country" for its unspoiled tropical beauty. This coastal state has a destination for everyone -- whether it's the beach, mountains, adventure, wildlife, heritage or culture you're interested in. The pace of life is slow, making it the perfect place for a leisurely vacation. Don't miss these top places to visit in Kerala. Known as the "Gateway to Kerala", Kochi is an enchanting city that's had an eclectic influence. Arabs, British, Dutch, Chinese, and Portuguese have all left their mark there. The architecture and historical sites in Fort Kochi attract most of the visitors to the area. If you have children, consider taking them to Wonder La Amusement Park in Kochi as well. There's also many hotels and homestays for all budgets. If you're interested in history, extend your time in Kochi to visit Muzuris, situated about an hour to the north of the city. This multicultural district used to be the most important trading port in Kerala, where business flourished for more than 1,000 years before it was severely damaged by a flood. It's being developed by the Kerala government as a heritage project. Muzuris extends to Kodungallur (where the astonishing and rather gory Kodungallur Bhagavathy temple festival takes place in late March or early April each year) and Paravoor. It's full of old churches, synagogues, mosques, and temples. India's first mosque, Cheraman Juma Masjid, was built there in 629 AD. Cochin Magic offers a full-day private Muzuris Heritage Tour. One of the most tranquil and relaxing things you can do in Kerala is to take a trip in a houseboat along the palm-fringed Kerala canals, known as the backwaters. Freshly cooked Indian food and chilled beer (buy your own and bring it on the boat) make the experience even more enjoyable. You can even spend the night out in the middle of a lake. Stay a few nights at a homestay or resort along the backwaters too. Bliss! For the ultimate experience, don't miss seeing a sunset from Kakkathuruthu Island on Vembanad Lake, as featured by National Geographic. Most backwater trips start out from Alleppey. If you're after an easily accessible and peaceful beach break in Kerala, picturesque Marari is just 30 minutes north of Alleppey. This placid fishing village has a long stretch of undeveloped beach and a diverse range of accommodations, from plush resorts to simple homestays. Some front the beach. Kerala's Periyar National Park, in the Thekkady district, is one of the most popular national parks in southern India. Unlike most other national parks in India, it stays open all year round, even during the monsoon season. Periyar is known for its wild elephants, and 30-minute elephant rides through the jungle are offered. Safaris are carried out by boat, with the lake being particularly captivating at sunset. Visitors can also take part in an excellent variety of eco-tourism activities there. If you like tea, a visit to Munnar is a must! The surrounding region is renowned for its sprawling tea plantations. See tea being picked and processed, and try fresh tea straight from the gardens. There's even a tea museum. The area is blessed with the natural beauty of winding lanes, misty hills, and forests full of exotic plants and wildlife. 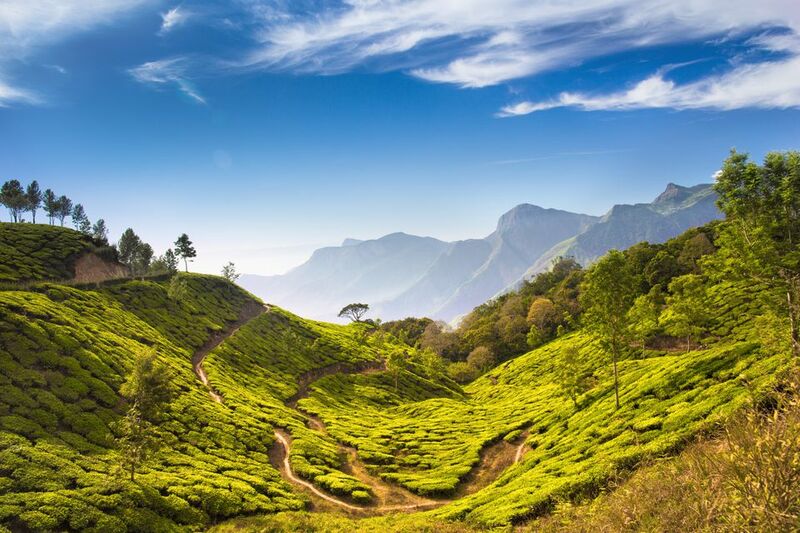 Adventure enthusiasts can trek to Anamudi, the highest peak in south India, explore Eravikulam National Park, or go rock climbing and paragliding. Munnar offers a diverse range of accommodations, surrounded by nature. The setting of Varkala beach is striking enough to take your breath away, with a long winding stretch of cliff and views that extend over the Arabian Sea. A paved footpath runs along the length of the cliff, bordered by coconut palms, quaint shops, beach shacks, hotels, and guesthouses. Nestled at the bottom of the cliff is a long stretch of sparkling beach, reached by steps leading down from the cliff top. It's not surprising that Varkala is one of India's best beaches. Wayanad is a bright green mountainous region that stretches along the Western Ghats. It has a great deal of scenic appeal. Abundant coconut palms, thick forests, paddy fields, and lofty peaks form the landscape. Due to the nature of its terrain, the area also has much to offer adventure enthusiasts. Popular attractions include trekking to Chembra Peak and Meenmutty Falls, exploring old Jain temples, climbing to Edakkal Caves, and wildlife spotting at Muthanga and Tholpetty Wildlife Sanctuaries. Another highlight of Wayanad is the many delightful homestays in the area. Glenora is one of them. One of the best places to get off the beaten track in India, the Kannur district of northern Kerala offers an ideal blend of secluded beaches and culture in the form of mysterious masked spirit-possession theyyam rituals (October until May) and hand loom weaving. Muzhappilangad Drive-In Beach is also located in Kannur. You can drive all the way along its vast stretch of sand! Kick back and relax at one of the inexpensive beach house accommodations, and enjoy the serenity. Kerala's most happening beach, Kovalam, is conveniently located about 40 minutes southeast of capital city Trivandrum and presided over by a distinctive lighthouse. It was catapulted onto the tourist map in the early 1970s when masses of hippies converged on it, as they followed the Hippie Trail to Ceylon (now called Sri Lanka). Kovalam definitely won't appeal to everyone because its main beach is bordered by a densely-packed row of hotels and does get busy, although there are quieter pockets in places. Did you know Kerala has over-water bungalows? You'll find them at Poovar Island Resort, about 30-minutes further down the coast from Kovalam. Granted, they're not as spectacular as some of those in the Maldives, but they're still recommended. Poovar Island is not far from the Tamil Nadu border and is quite an amazing natural wonder. It lies at the point where the Neyyar River meets the Arabian Sea. In between is an elongated sand bar. The main attraction for Hindus who visit Trivandrum is the 16th-century Padmanabhaswamy temple, dedicated to Lord Vishnu and built by rulers of the kingdom of Travancore. A great deal of wealth has been hidden in the temple, making it the richest temple in the world. Some of the treasures were recently unearthed but the largest vault remains unopened. Unfortunately, if you're not Hindu, you won't be allowed to go inside the temple unless you declare you believe in Hinduism. Trivandrum also has some interesting museums and galleries, housed in classical heritage buildings. These include the Napier Museum, Natural History Museum and Sri Chitra Art Gallery in the museum complex, and Kuthiramalika Palace Museum outside the Padmanabhaswamy temple. Jatayupara Earth Center is an ambitious new attraction in Kerala. It opened in late 2016, in Chadayamangalam village in Kerala's Kollam district, about an hour north of Trivandrum. The park is spread over an astonishing 65 acres and is themed on the Hindu epic The Ramayan. It's dominated by a 200 feet-long landmark sculpture of Jatayu, the mythical vulture that's believed to have been killed on the rocky hilltop while trying to rescue Sita from Ravan. Notably, the sculpture is considered to be the largest of its kind in the world. The park has more than 20 adventure activities, a 6D theater that shows the battle between Jatayu and Ravan, a virtual reality museum, an Ayurvedic healing cave, and cable car (aerial tramway) to transport visitors up. An initiative of the Kerala state government, Sargaalaya won a National Tourism Award for Best Rural Tourism Project in 2016. This tourist village was set up at the pretty village of Iringal, in Kerala's Kozhikode district, to provide a platform for talented artisans to display their craftsmanship. Visitors can see the artisans in action and buy their wares. The Sargaalaya Iringal International Crafts Festival takes place there every year from the third week of December to first week of January. It's south India's biggest handcraft fair, with about 400 artisans from all over the world attending. If you're someone who likes to go completely off the tourist trail, you'll enjoy exploring the culture along the River Nila (also known as Bharatapuzha). This river is the longest in Kerala, and its riverbank home to many communities that are involved in traditional activities such as pottery, weaving, puppetry, folk art and dance, music, and martial arts. They all share a deep bond with the river. The Blue Yonder, an award-winning responsible travel company, conducts guided trips and is working diligently to keep these traditions alive. Stay in a cottage at the Riverside Retreat, centrally situated between Kochi and Calicut. Visiting a village, where it feels like time has stood still, is an excellent way to learn more about the rural way of life in Kerala. You'll get to observe all kinds of local industry and skills. The focus on village tourism has grown in recent years, and a number of destinations have been developed across the state. Kumbalanghi Village is a convenient option on the outskirts of Kochi. Kerala Tourism also arranges trips to villages around Kovalam, Kumarakom, Wayanad, Thekkady, and Bekal.